Hey everyone so it’s the first Sunday and I am so grateful to God for all that He has done and for all that He will continue to do. I just wanted to encourage you all to please go to church today and bless The Lord with the first fruits of your substance. As children of God we should not feel or be forced, obliged, or pressured to do give to the kingdom of God. Thanks to the grace of The Lord we do not need to offer bulls or lambs unto The Lord, but notice how the Levites so reverenced the presence of God singing, ministering, bringing offerings, and tithes into the storehouse. If the Levites could display the gratitude for The Lord in such a way what makes us so different? Thank The Lord that He has lifted the yoke, the heavy load, the burden, we no longer need to offer the blood of anything for the Lord has given us His blood, yet we still complain. Do we reverently fear The Lord?Just remember that the fact that The Lord has given us breath should be enough to remind us that we must bless The Lord with all our heart, our soul, and all that is within us. It does not matter how big or how small God sees our hearts. It doesn’t matter how old or how young we are. Remember His goodness, remember His loving kindness, remember His grace, remember the price that He paid for us is incomparable, immeasurable, indescribable to how big or how small the tithes are that we bring to His storehouse. He blessed DaFruit of our hands, He blessed DaFruits of our lips, He is faithful, He sees us through every season, He causes you and I to bear good fruit in due season. He deserves our gratitude, He deserves our praise, He deserves our sacrifice, and He surely deserves our first fruits. Without the presence of The Lord I may as well be nonexistent, for there would be no me without You. If you understand God’s love for you, you wouldn’t need much convincing on giving to the kingdom of God. If we call ourselves Christians yet give all our time to everything besides the kingdom of God, then our faith is questionable because where our treasure is there our hearts also will be. Ask yourself is your heart in His kingdom or in the world. If your heart is in the world and in the kingdom of God then you would pretty much want to give more to the world and to the flesh than you would want to give to the kingdom of God and God said you can’t serve both God and satan, you can’t be lukewarm, a double minded man The Lord describes as unstable in all His ways. Don’t allow the enemy to blind you and fool you into believing that if you give to the kingdom of God you are gaining nothing. This is an ultimate lie. The enemy knows who we are, the enemy knows that we are heirs to the kingdom of God and therefore we shall lack in nothing. The enemy knows all this so do not allow him to deceive you. Going by the logic of this world bringing the first fruits this doesn’t make any sense. How do you expect me to bless The Lord with my worship, with my soul, with all that is within me when I can’t see the blessing? We see the blessing through faith through the eyes of The Lord and not the eyes of the flesh. Faith is the key to the breakthrough of the season of reaping the harvest all we have got to do is sow, sow our time into His kingdom, our love, our substance, our all and we shall surely taste and see that The Lord is indeed good. Come on guys this year lets do things differently. Lets go before the King with great expectancy. Lets serve The Lord wholeheartedly and not partially. We must see a change in our lives this 2014 there must be a breakthrough we must not remain the same. I’m just reading this post again today the 30th January 2015, and I really do just thank God for His Word. Yesterday, a guest preacher shared a very deep and convicting message on the first fruits, and because of the revelation that I got from this message I just have to share with you some of what he said, and also what The Lord revealed to me. I pray you’ll be blessed by it. This year like Jacob, I refuse to let go of The Lord until He blesses me. ‘Your salary is not enough to do what God has called you to do. Abel was a keeper of sheep but Cain was a tiller of the ground. Just because brothers come from the same womb it does not mean they must have the same vision, or they must have the same career. The beginning of time, so this should not be happening now. Therefore parents should not force their children to do the same as so and so, they must pray for God’s will to be done in their children’s lives, and not for their own will to be done, that’s selfish. Remember God is not a respecter of persons, but He is a respecter of His Word. 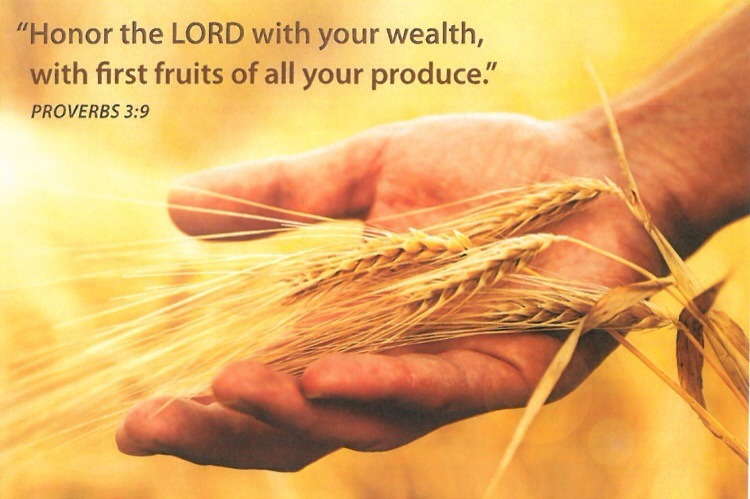 Now, until I heard this great message preached I thought the first fruits was your tithes but it is far from it. The first fruits is all of your first salary, of your income, and it is required of you. This is not Old Testament, search The Word you’ll find that this is pure truth. Many of us want to receive the blessing, but many of us are not willing to sacrifice. Many of us are not willing to give our first fruits. If we want what David had are we willing to live our lives as true worshippers of God? It’s easy to say I want what this person has it’s another to do what that person did to get it. What’s that You have in your hand? If you’re willing to lose it. I’ll take the little you have and make it grand. I am ElShaddai and I’ll more than supply your need. It’s easy to sing the about the blessings of Abraham, but are we actually seeing it? It’s time to apply the principles of God’s Word, and God’s Word works! It’s not everyday ask and you shall receive. Sometimes it’s give and it shall be given unto you. Christians love to ask, but when will we give? The more you sow the more you reap. Isn’t it about time we enjoy this life that God has given us? That’s New Testament for you. For the same measure you use, it shall be measured back unto you. Too many believers are missing out on the blessings of God. It’s about time we say enough is enough. I am not satisfied until I see the hand of God working in my life. I must no longer miss what God has given to me. I must reap the harvest, and I must recover all that the enemy has stolen from me. This is the year of joy, I must rejoice this year. He told me that this is the year of more, therefore I must see more in every area of my life. And if I want to see more of God in every area of my life, then I must be willing to give more. More of my substance, more of myself. We cannot expect more from God if we’re not willing to give more. He does not work like that. He is a respecter of His Word. We must apply His principles. That’s why satan has stopped many believers from giving, satan does not want believers to prosper at all! And he has deceived many. If God could favour Gideon the least amongst his clan, then why can’t he favour me? God changed Gideon’s name from the least amongst his clan to Mighty Man of Valour. I believe and trust in His Word, therefore I must bear the fruits of that in which I believe. I’m no longer satisfied with where I am. There must be a change, a shift. Israel is the first fruits the first born of God. God says anyone that devours His first born, disaster shall fall upon them. The first fruits, the first born, leadership is very important to God. It is necessary that all believers understand this. That is why when Adam and Eve ate the fruit God did not go to Eve first, He went to Adam, because Adam was the leader of his home. If you live anyhow expect anyhow results. That’s why leadership does not come cheap. The more that is given to you, the more that is required of you. The more you worship God, which is selflessness, which is sacrifice. The more God will elevate you. There are principles to the Word of God that we are required to follow. Remember God is never a respecter of persons, but He is always a respecter of His Word. Do not be deceived by what you see in this world. The world tells you that you can be successful without God, but the world fails to tell you that without God you can never live forever. Isn’t that all that the world desires? Well if that’s what the world wants then the world must accept JESUS and not satan. God says He gives, and adds no sorrow. satan says he gives, and adds sorrow. You can be rich and still be living in sorrow. That is a life without God, and a life without God is not life, but death. satan requires you to sell your soul to gain riches, but God says those riches are already yours and you don’t even need to lose your soul. satan knows what is yours. The problem is you not knowing what is yours. That’s when the enemy can step in, and take advantage. It’s become so easy for a rich man to reject God, and so easy for satan to deceive such a man from receiving long life, good health, peace. Witchcraft does not only happen in Africa, it’s everywhere even America, even Britain. People are not only selling their souls for money in Africa, it’s everywhere even America, and even Britain. Propaganda is very real in this day and age. Do not allow the media, which is controlled by satan to deceive you. Very much of what you see happening in a typical Nollywood movie is what is happening in Hollywood. Many of them have sold their souls. I’m not saying all of them have, but many of them have. All they need to do is reject God, but by rejecting God they reject long life, good health, joy, and peace. How many celebs die due to the usage or the suspicion of ‘drugs’? Never desire to have the riches of satan, he requires your soul and he adds sorrow. Desire to have the riches of God, He requires your first fruits, that you seek Him first.He adds no sorrow, but life, and life in abundance. When all believers understand that both the old and New Testament are relevant, they will never miss out on the promises of God. God said it, His people are perishing from lack of knowledge.